Why Start the FDA Nutrition Label Changes & Updates Now? Could Your Commercial Package Design Fail? 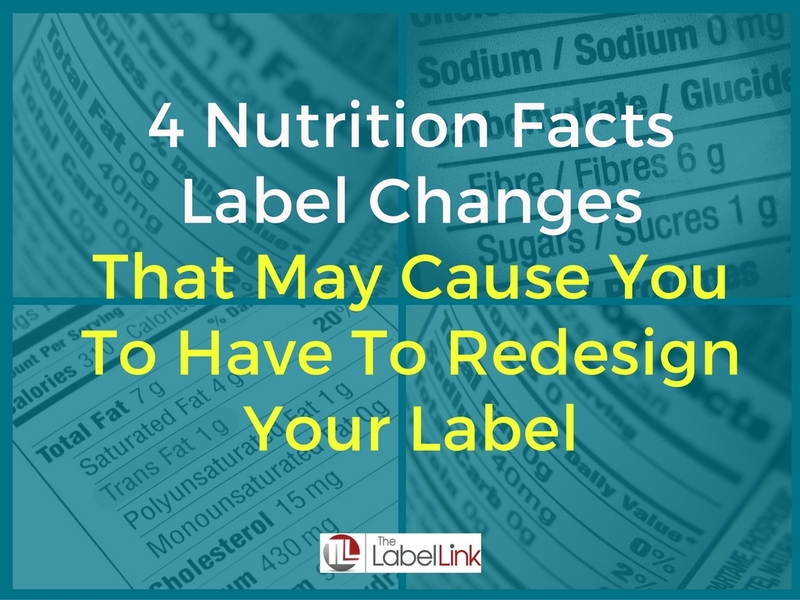 Did You Know That the changes in Your NF label may cost You Precious Real Estate? Will Your Labels Have to be Updated After the Latest FDA Nutrition Label Changes? The FDA has done it! They’ve made significant updates to the nutrition facts labels and now, food manufacturers are scrambling to keep up. If you’re a food manufacturer, you know the struggle. Will you have to reprint all of your labels? Will you need to redesign all of your labels? There’s a lot swirling through your business right now when it comes to keeping up with the latest FDA nutrition label changes and we’re here to help. At first glance, it’s clear there’s a lot that’s changed on the latest edition of the nutrition facts label but what will this mean for your business? Probably the most important thing it’ll mean is an update to, not only your nutrition facts label, but also your entire label design. This should be started now rather than waiting until the new guidelines are mandatory in 2018 (or 2019, depending on the size of your company). Take a look at the new changes and you’ll see why. Here is a quick rundown of what you need to know about the biggest and most important updates just passed by the FDA. The minimum font sizes for the number of calories per serving has changed. Now, the minimum font size is 22pt. The word “Calories” itself must be at least 16pt font. The serving size must be at least 10 pt font. And the actual ingredients must be at least 8pt font. The goal of setting these new minimums is to add more transparency for the buyer. If you adhere to these, the buyer will be able to clearly read how many calories are in each serving, the serving sizes, and the ingredients in your product. The problem this will pose to some food manufacturers is the increased amount of real estate these new font sizes will consume. If your minimum font sizes aren’t in line with this now, it’s important to start planning how you’ll adjust your graphic design on your label. This new layout could mean a new look for your products. Serving sizes have changed over the years. What was once considered a normal serving size is now considered small. This has led to some consumer confusion so to account for it, the FDA is requiring manufacturers to put what is most likely to be consumed in one sitting. One example of this is soda. Most people consume all 12 oz. or 20 oz. in one sitting, so soda bottle labels must be for one serving regardless of size. Another example is ice cream. In the past, the average serving size was ½ cup. Now, it’s increased to ¾ cup. In addition to changing the serving sizes, the FDA also wants to add transparency to the number of calories in a container of food. This will require food manufacturers with at least two servings in one container to have dual column labels. In the first column, manufacturers will have to put the new serving size amounts. Right next to those amounts, manufacturers will have to put the total amount of nutrition facts for the container, if there are at least two servings in the package. For example, if you sell a pint of ice cream, you must put the total calories for one serving of ice cream and for the entire pint. Boxed foods that require you to add extra ingredients for the finished product (such as puddings or cake mixes) will also be required to have dual column labels. The first side will be the nutrition for the items in the box and the second side will include the nutrition facts after the product has been made with all of the ingredient additions (milk, eggs, oil, etc.). What if you only have one serving in your container? If that’s the case, you won’t need a dual column label. But how do you know if you have a single serving container? That’s the trickier part. The Reference Amounts Customarily Consumed (RACCs) is used as a reference point to determine whether your product should be labeled as a single serve or not. In the past, if the product contained between 150% – 200% RACC, manufacturers could choose whether they labeled the product as single serve. That’s not the case anymore. If your product contains less than 200% of the applicable RACC, it is a single serve product. No ifs, ands, or buts about it, unless you fall under one of the exceptions (we told you this was tricky). One exception is RACC size. If your product has a large RACC (over 100g or mL, for example), you do not need to label it as single serve. The other exception is for infant/children’s food products. That’s because the serving sizes (and thus nutritional information) are different for infants up to a year old compared to children under the age of 3. Regardless of serving size, infants and children’s food generally must have a dual label. One side would contain nutritional information for babies up to one year old. The other side would contain information for children up to 3 years old. Question: Do you anticipate having to redo your labels after the latest FDA updates? Here’s a sample of what the new label requirements look like. And here’s a link to the final rule. As you can see, these changes are significant when it comes to the look and feel of your labels. Prolonging your new graphic design could cause you a tremendous amount of headaches down the road. Even though the compliance date for these changes doesn’t go into effect until July 26, 2018 for manufacturers with food sales over $10 million(or July 26, 2019 for manufacturers for food sales less than $10 million) getting started early is critical. We’re here to help. Get in touch with one of our label experts to talk about your food label and learn what specifically you’ll be required to update.